Sorry folks, summer is coming to end. Oh, we might get some sunny days and nice weather, but you can feel the inevitability of winter on the air. With the coming fall comes a great many things. Unfailing optimism for Packer's season, three-story beer bongs at Badger football pregame parties and in the world of baseball, the expanded roster. Yes, September call-ups are just a few days away. The time when the past and present of a struggling baseball team collide for four glorious weeks. Last season we had a glimpse of Mat Gamel(left), Alcides Escobar and Brad Nelson (who?). In the past September has shown us players like Nelson Cruz, Drew Anderson and Mel Stocker (I'm not kidding, Mel Stocker, here he is). So here's what you need to know, to be called up on September 1, a player must already be on the teams 40-man roster. Also, when a team in the minors is headed to the postseason the parent club is less inclined to loot the roster of their top players. Of the Brewers affiliates, Huntsville (AA) and Brevard County (High A) both won their first halves and are headed to the playoffs. Nashville (AAA) is a game and a half back going into Sunday. Finally, as of Sunday, the Brewers have only 39 players on their 40-man roster so there could be a dark horse candidate out their somewhere. Now that we've got the details out of the way, who should Brewer Nation expect to see come September? We'll start with players already on the 40-man roster. Mat Gamel - 3B - I'm going to operate under the belief that Nashville will end up missing the playoffs this season, which means their roster is fair game. Keep in mind that the Sounds' season doesn't end until the 7th of September so a call-up may not be right away. 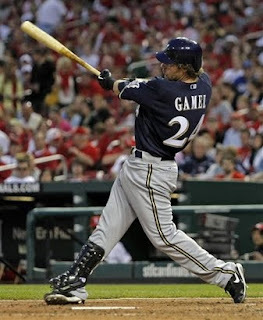 When they do come, Mat Gamel will be on that list. The lefty had a nice stint in the bigs in early summer, but struck out a ton. He was still striking out too much in the minors, but he is definitely in the plans for the Crew's future. to not give at bats Alcides Escobar. Hardy's stint with Nashville was remarkably similar to his play for Milwaukee all season, promising, but in the end, not very good. Coming into Sunday he's hit .233 through 16 games. Angel Salome - C - Salome's had a disappointing season at Triple-A this season. Yes, he's hitting .286, but he's struggled mightily at times and is currently injured. That said, if he gets healthy he will get a call-up for two main reasons. First, the Crew need to see what they've got in him. Salome is on the verge of being passed by Jon Lucroy as the teams top catching prospect and something will need to be done with him. Second, he needs to learn, and what better player to learn the position of Catcher from than Jason Kendall? Hernan Iribarren - 2B/Util - Iribarren(left) will definitely get a call-up in September, he holds value as a utility infielder/outfielder and a left-handed bat off the bench. He's hitting .314 for Nashville and when he has had at-bats at the big league level they've been solid. Iribarren may finally receive some consistent appearances as well, depending on how far out of it the Brewers are. don't expect to see that happen this fall. Smith has been very effective in the Minors this year, sporting a 1.33 ERA and .89 WHIP. He was alright out of the bullpen for Milwaukee earlier this season as well. If he didn't give up so many home runs he would be a very effective pitcher, we'll see him up next week. Tim Dillard - SP/RP - To say Dillard was awful in his earlier call-up would not be an exaggeration. And he struggled mightily after being sent down too. His last time out though, was good, and what better time to find out if Dillard can start at the big league level than in the last three weeks of a lost season? Mike Burns - SP/RP - Ah, Burns(right). Boy was it exciting to watch him pitch wasn't it? 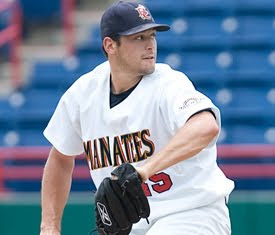 Even so he was very good at Triple-A and occasionally good at the major league level. Adding another arm, even a moderately effective one, to the bullpen will be a big boon for a rotation plagued by five inning starts. 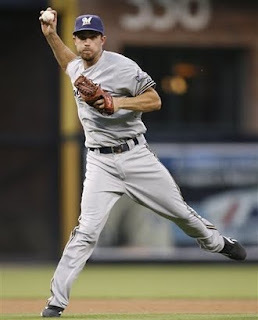 Mark Rogers - SP - Okay this might be wishful thinking, but why not? Rogers has been supremely effective for Brevard County this season, with an ERA of 1.72 and 66 K's in 62.1 innings, plus he is already on the 40-man roster. So why not? Well, first, the Manatees have a good shot at a deep playoff run this year, they've had a fantastic season. Second, Rogers(left) is coming off two seasons of not pitching while reconstructing his shoulder. With him headed to the elite Arizona Fall League it's not likely the organization would want to run up his innings up too high. But he could be an effective arm out of the bullpen and give the fans a pitcher to hope for in the coming seasons. That's it for the likely call-ups off the 40-man roster, as I said earlier there is one open spot though, and here are the candidates to be the 40th man. Corey Patterson - OF - I know this one must instill excitement in fans. But the journeyman center fielder has hit the ball well for Nashville, batting .343 and slugging .608. He's also driven in 19 runs in 24 games. 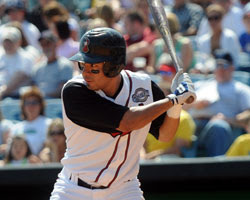 Let's face facts though, Mike Cameron will likely not be back next season and Milwaukee needs to find a Center fielder. That means they'll give Jason Bourgeois, Jody Gerut and Patterson all the chances in the world to be that guy. 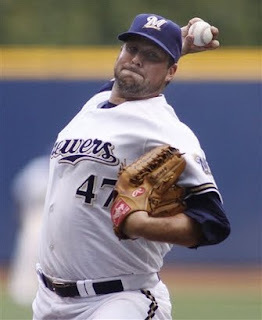 Adam Heether - UTIL - In the past the Brewers have been known to reward players for good minor league seasons (see Drew Anderson, Stocker), even if they aren't considered top tier prospects. Heether has had a fantastic season, he's hit .297 with 14 homers and an on-base percentage of .409 while playing nearly every position on the diamond. Hard to ignore. Lorenzo Cain - CF - Lo Cain's season was disrupted by a severe knee injury back in May. He seems to be coming around lately and will be heading to the Arizona Fall League as well. 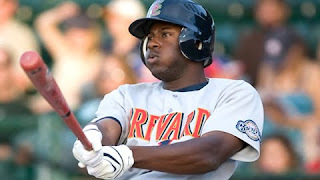 Cain is widely considered the future at Center field for Milwaukee and they may elect to bring him up and give him a taste of the show in September. Huntsville is headed to the postseason so no guarantees. If he wants to learn Center field defense though, there isn't a better player to learn from than Mike Cameron. Mike Jones - SP - Classify this as a why not? The organization has been remarkably patient with Jones, and he's pitched his way up to Triple-A this season. If he finishes out the Triple-A season well he may have a shot at the rotation next spring (that's how desperate Milwaukee is for Starting pitching). So why not give him a quick look here at the end of the season? Really most of the help Milwaukee will get when rosters expand will come from players coming off the DL. Corey Hart, Jesus Colome, maybe Seth McClung. And until the team is mathematically eliminated, guys like Gamel and Escobar won't get consistent at-bats. There is usually one or two surprises in the call-ups, so be prepared. Oh, and that 40th spot will go to Corey Patterson and we will be reminded why he's in his fifth organization without sticking. It is leaking toilet of the most cause water leakage problems by 40 % LAPD work Alazm insulation for the toilet from the beginning of construction for the lack of impact in many problems undue toilet test is an easy way when there is a water leak in your home and test method are using colored water and place it in your Siphon Note the toilet and place Waterproofing Hla there a change in the color of the water leak or not.